The use of non-secular, religious, concepts in contemporary managerial discourse to legitimise leadership, organisation and work has been undertheorised. Concepts such as organisational soul, Spiritual Leadership, a wider deification (and demonisation) of leaders, and the mantra of individual freedom each evoke long religio-historical roots. The deployment of such terms in the present to (re)enrol people into the service of capitalism speaks both to high levels of religious belief worldwide and, more specifically, to a history of religion intersecting with public life in the US—a context pivotal in the development and dissemination of managerialism and wider neoliberal discourse. Organised around the concepts of Gods, Devils, Soul and the Individual this book will show how these concepts are being employed in current managerial, leadership and organisation discourses, critically examine the religio-historical and philosophical roots of such, and demonstrate how the religio-historical and religio-philosophical can be brought into the lexicon of critical organisational scholarship to provide a language to engage with the non-secular legitimation of capitalism and its institutions. In so doing, this book is a timely addition to organisation and management theory. It comes at a time that is witnessing a wider ‘theological turn’ in continental philosophy, mounting calls within organisation studies to ‘take religion seriously’, and an ongoing legitimation crisis of neoliberalism, one that is raising pivotal questions concerning how neoliberalism endures despite the deprivations and harms it occasions. This book is intended to be engaging and erudite, drawing upon a trans-disciplinary combination of popular and academic management texts, contemporary and classical philosophy, literature and religio-historical sources foundational in the construction of the Western subject. 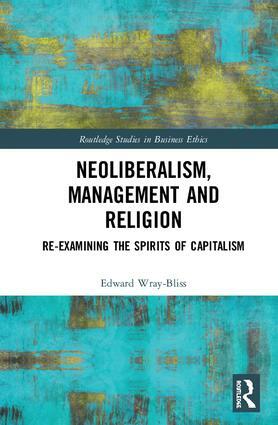 Edward Wray-Bliss is an Associate Professor in the Department of Management, at the Faculty of Business and Economics, Macquarie University, Australia. His research examines the ethics and politics of organisational, managerial and academic life.